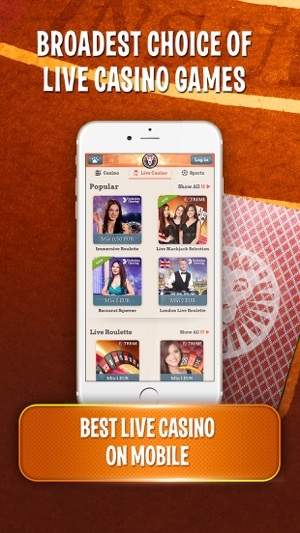 We welcome all the lovers of Live Casino to the top notch new app from LeoVegas! 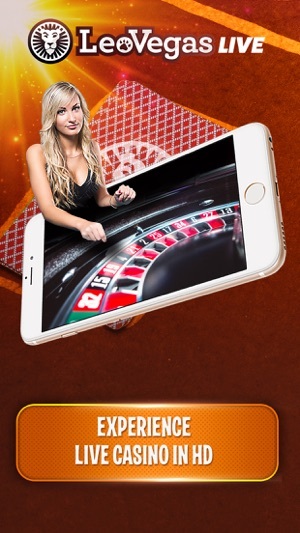 Enter a genuine casino environment where you will be greeted by all the background buzz of a real casino and live croupiers - you can experience it all whilst playing from your phone. You can chose from classics such as roulette and blackjack but if you want to take it to a new level, you can try the innovative Baccarat Squeeze or Immersive Live Roulette! This supersonic game app will give you instant access to all the thrills that Las Vegas has to offer – take a seat at one of our fabulous tables in one simple click. 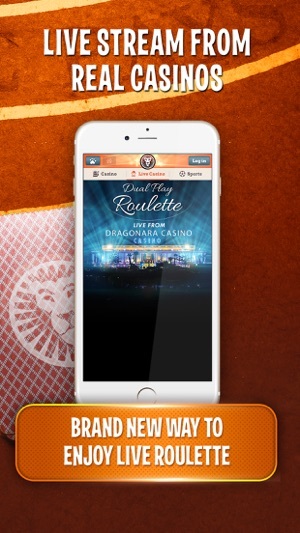 Take the express route to endless entertainment via your mobile or tablet today with the Live Casino app from LeoVegas! Everything will function as normal – download the app and start the game to get going! 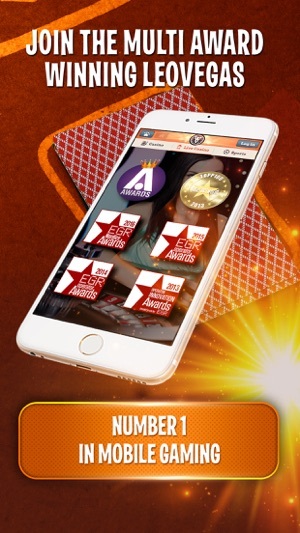 Award winning Leo Vegas mobile casino delivers world leading casino entertainment to your computer, mobile and tablet. Leo Vegas’ mobile casino combines unbeatable bonus offers and royal campaigns with an enormous selection of casino games. Lightning fast withdrawals and a customer support is team on hand 24/7. Welcome! When you use this app you play from the same gaming account as if you were on LeoVegas.com. If you don’t already have an account in the Leo Vegas online casino don’t worry - creating one takes literally less than a minute. All new players can look forward to a royal welcome offer with bonuses and free spins. Enjoy the thrill of Vegas – today! SLOTS OPERATOR OF THE YEAR at the prestigious EGR Operator Awards 2015 – the gaming industry equivalent to the Oscar awards. MOBILE CASINO PRODUCT OF THE YEAR at the EGR Operator Awards 2014. Leo Vegas Gaming Ltd. operates under and governed by the Maltese Lottery Inspection, MGA, and holds the following licenses: MGA / CL1 / 882/2013 issued December 6, 2013 and MGA / CL1 / 883/2013 issued 6 December 2013. In the UK under license from the Gambling Commission - UK Licence Number: 000-039198-R-319450-001. 18+. Terms and conditions apply, deposit required. Visit leovegas.com for full terms and conditions. LeoVegas Gaming Ltd is licensed and regulated by the Malta Gaming Authority (MGA) and holds the following licenses - MGA/CL1/882/2013 issued on 6 Dec 2013 and MGA/CL1/883/2013 issued on 6 Dec 2013. In the UK under licence from the Gambling Commission - UK Licence Number: 000-039198-R-319450-001. 18+. Terms and conditions apply, deposit required. Visit leovegas.com for full terms and conditions. 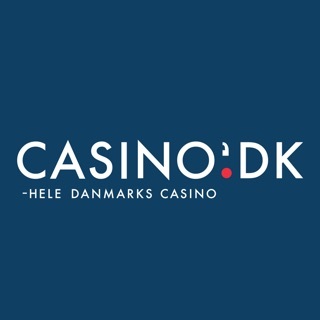 Velkommen til LeoVegas Live Casino - HD kvalitet live casino! Det er med stor sorg at jeg kan berette om min triste skæbne, før jeg downloadede denne app havde jeg en vidunderlig smuk kæreste, hun gik fra mig da jeg spillede hele min månedsløn væk på et par timer, nu sidder jeg i beskidte underbukser og spiller videre. Cool med live. Det spiller.